Obtaining cloud climate data records from the current generation of global imagers (MODIS, VIIRS) is challenging due to the need for exacting reflectance stability over multiple decades. Imager stability requirements for ocean color applications have been demonstrated to the sub-percent level for SeaWiFS using lunar observations; similar capabilities for the PACE Ocean Color Instrument (OCI) are defined in the PACE Science Definition Team (SDT) report, in addition to stringent requirements in other radiometric/spectral specifications that are essential for the establishing climate records. Understanding the extent to which the PACE imager can be used to produce relevant and stable cloud products is of strategic importance. 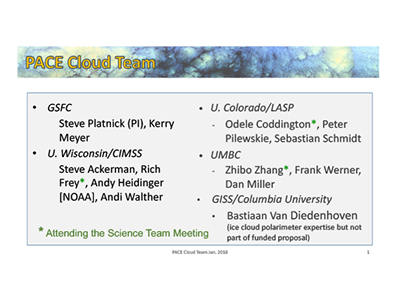 We propose to support PACE ocean color imager instrument requirements related to cloud property retrievals as part of the Atmospheric Correction measurement suite. Initial studies on the use of OCI for initiating cloud records were studied by the SDT for instrument options that included three additional spectral channels (OCI+) in addition to higher spatial resolution in selected channels (OCI/A). 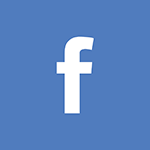 The team will participate in instrument specification, trade studies, and mission/instrument development laboratory studies as they pertain to cloud retrievals and information content from OCI+/A. Studies will include use of the instrument for cloud detection, thermodynamic phase detection, optical/microphysical retrievals, and cloud-top information from the O2 A-band and water vapor bands. 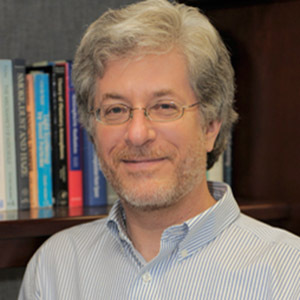 More broadly, the team will study the retrieval capability of an OCI+/A instrument relative to MODIS and VIIRS cloud data records, with the goal of understanding the ability of a PACE imager to continue and/or compliment the existing imager products using a combination of theoretical and empirical retrieval studies. The SDT report has already provided nominal retrieval capabilities and associated science for a 3M polarimeter. 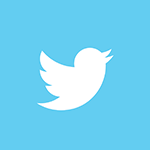 Though our team has theoretical and practical experience with polarimetric cloud retrievals, we have not explicitly budgeted for additional studies due to continued uncertainty in a PACE polarimeter. The PACE SDT report provided details on imager options, measurement specifications, and derived science. 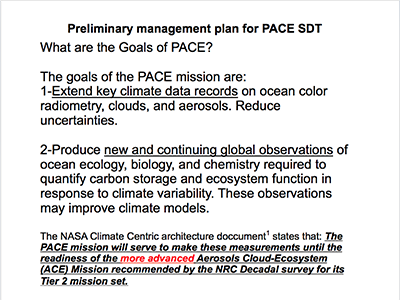 However, as acknowledged in the solicitation, the PACE mission instrument suite and measurement requirements have yet to be determined, especially with regard to cloud retrieval capabilities. 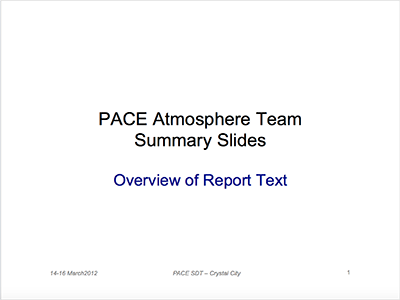 Further, the team is being solicited before the scope of an Announcement of Opportunity (AO) for the PACE instrument(s) is known. 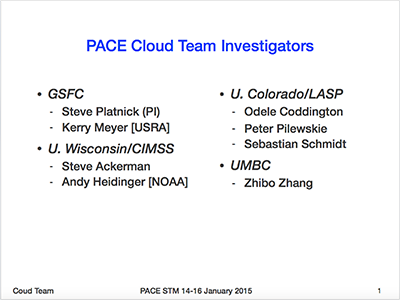 Therefore, it is critically important to have comprehensive cloud retrieval expertise on the PACE Science Team. 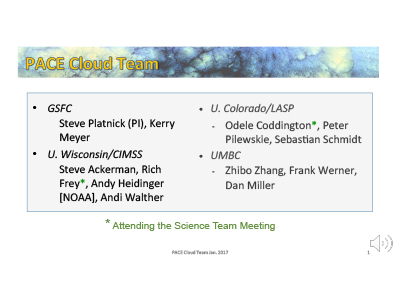 The proposed multi-institution team collectively provides broad research, observational, and measurement experience in cloud remote sensing, and is well-suited for carrying out retrieval studies as PACE mission instruments and objectives evolve. 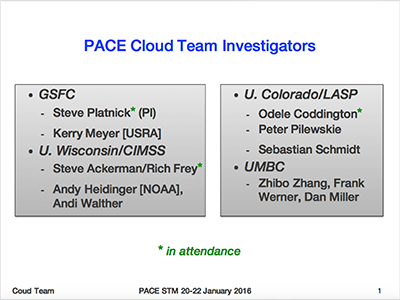 Several team members contributed to the PACE SDT report and associated Instrument and Mission Design Lab studies.